One of the more difficult task in building a cabinet is constructing an attractive looking while functional door. There are a number of door design option and installation techniques to choose from. If you want to make a raised panel for a frame and panel door, you'll be in the market for a raised panel router bit. Are they all alike? No - there are a few important differences. Below, we'll cover the basics of the two main raised panel bit configurations and offer advice on which one to choose. There are two basic types of raised panel bit: vertical bits and horizontal bits. Horizontally oriented raised panel bits, like the ones you see on the right, are similar to the raised panel cutters designed for use on a shaper. To use one, you lay the panel flat on the router table and use either the router table fence or the bit's pilot bearing to maintain a consistent reveal width during the cut. Some of the true custom cabinet makers and cabinet shops typically out source their cabinet doors to large cabinet door manufacturers. There is usually large debates on whether or not the custom cabinet maker or cabinet shop should make their own doors of it they should out source to custom cabinet door companies. Here is a guide on how to make a simple Shaker style raised panel cabinet door without utilizing the router and router bits that so many professionals use. The vast majority of weekend woodworkers do not own a router that is up for the task of serious cabinetry so here is a simple way to fashion cabinet doors utilizing only a table saw instead of a router. If you have an old bookcase or open shelves that would look better if enclosed, why not learn how to build cabinet doors for them. This woodworking project is easy, and yet it renders magnificent results. The bookcase featured with this article was open, allowing all the mess on the shelves to show. When you install a flush-mounted door, you simply place one rectangle inside another, right? Well, we all know that looks can deceive in the world of woodworking. Door installation can quickly zoom past "simple," and go all the way to "frustrating." Having deciding on a door type, the hardware becomes a consideration. We use European Hinges almost exclusively. They can be used on Traditional Cabinets, meaning those with face frames, or European Cabinets, meaning those with no face frame. They can be used with inset, full or half overlay doors. 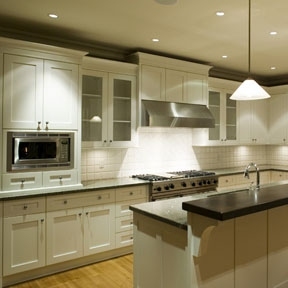 Kitchen cabinet doors sustain a lot of use on a daily basis, yet get little respect. Actually, the one time they get any mention is when they don't close properly. Perhaps you're building kitchen cabinet doors since your old ones gave up the ghost or maybe you're installing new cabinets and need to put your distinguishing touch on them. Raised panel doors have long been a hallmark of fine cabinetry. Unfortunately, many hobbyists and weekend woodworkers think that making cabinet doors requires years of woodworking experience. In fact, that's not the case at all. Below, we'll take a look at some of the tools and techniques that make building perfect frame and panel doors a process that anyone with a few basic woodworking skills can enjoy.